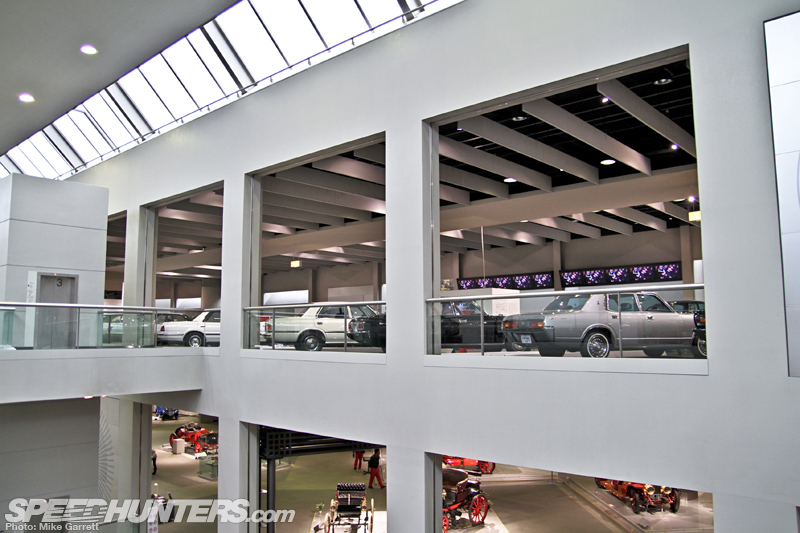 Last week I took you guys through half of the gigantic Toyota 75 exhibit at the Toyota Automobile Museum in Japan, and now I’d like to pick up where I left off with more from this one-of-a-kind display of automotive history. 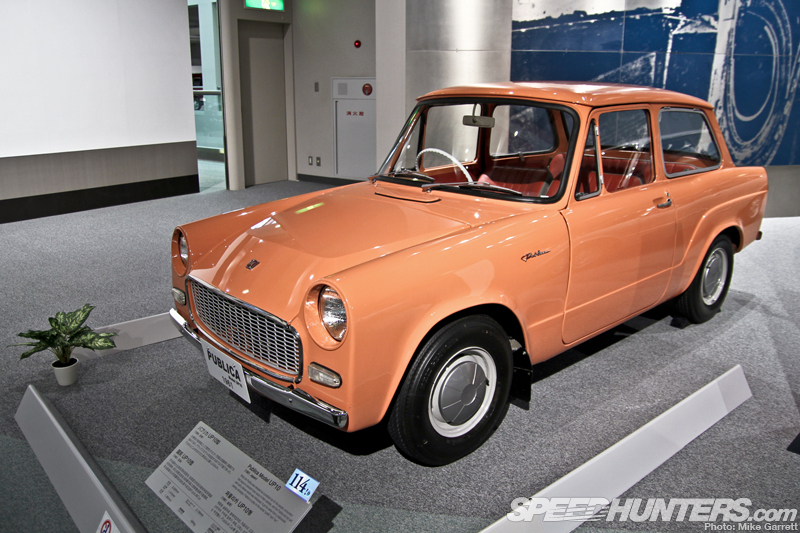 In the first post we saw some of Toyota’s earliest vehicles and got a history lesson on the Toyota Crown, among other things. 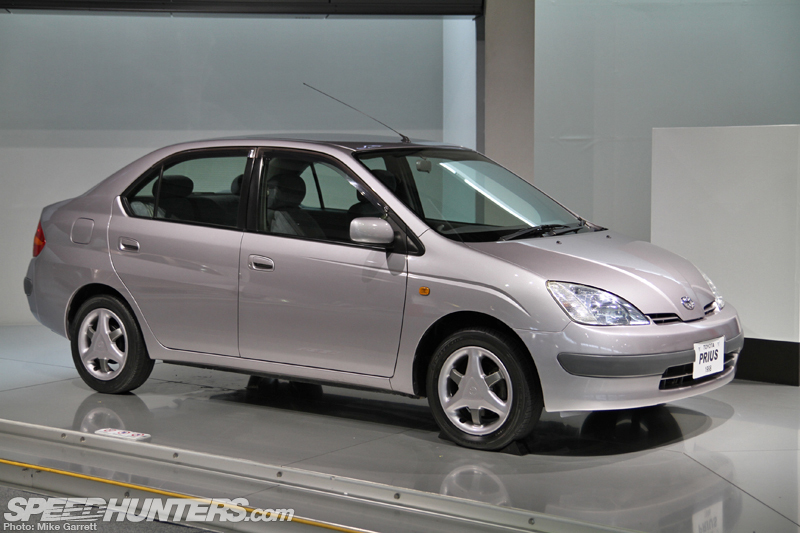 This time we have Corollas, Celicas, minivans, trucks and a whole lot more. While the Crown is certainly one of Toyota’s most historically important nameplates, its global significance is far outweighed by that of the Corolla. Fittingly, the Toyota 75 exhibit also included a large area dedicated to one of the world’s best selling models of all time. Long before the introduction of the Corolla, Toyota had aimed to build a “car for everyone” and its first major attempt at this came with the introduction of the Toyota Publica in 1961. Without the lessons Toyota learned while building and marketing the Publica, the Corolla would likely not have experienced the success it did. 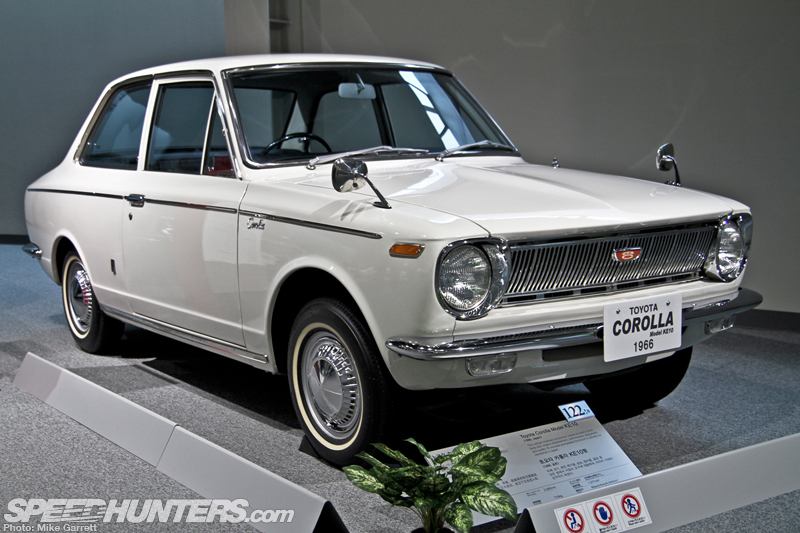 In 1966 the first generation Corolla went on sale as a direct competitor to the Nissan Sunny, which was released the same year. Together the two cars played a huge role in Japan’s booming motorization. 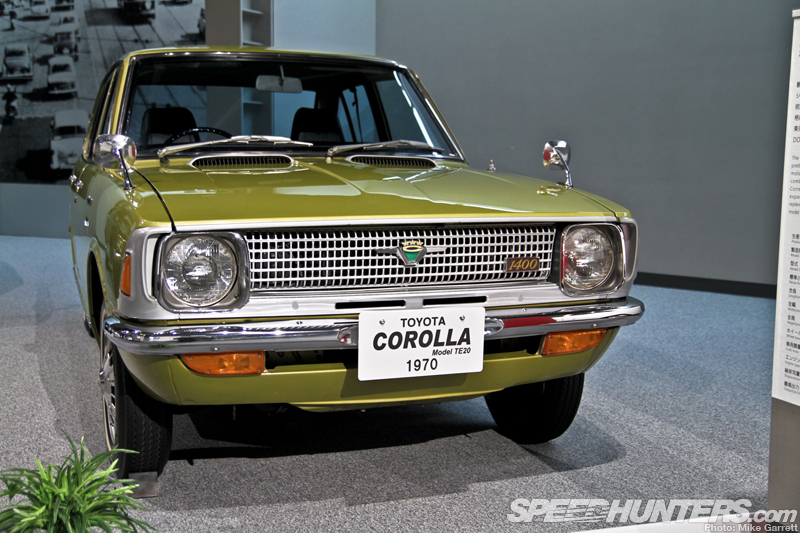 The Corolla mixed economy, comfort and stylish looks with a large for the time 1,100 cc engine and was also one of the first Japanese passenger cars to feature MacPherson strut front suspension. The second generation Corolla appeared in 1970 sporting a slightly larger size and updated styling which left behind the front quarter windows of the first generation car. 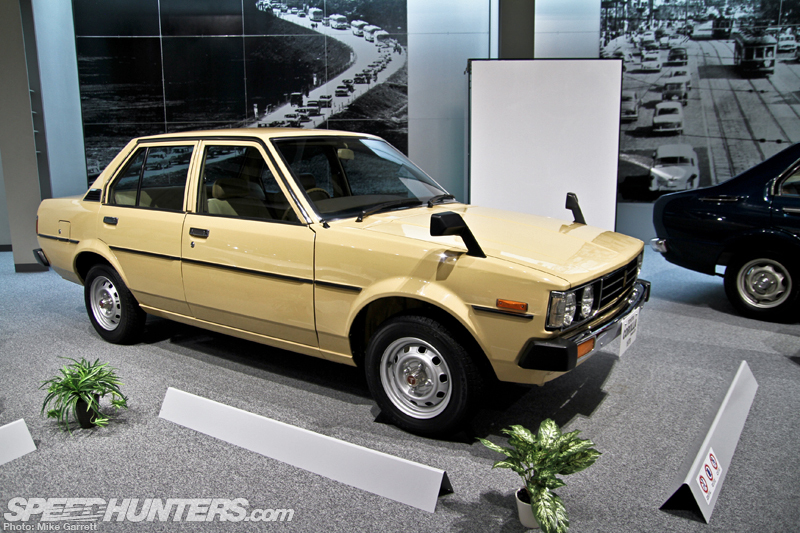 Because the Japanese were continuing to drive more and more at the point, the second generation Corolla also came equipped with a larger fuel tank that allowed the car to travel between Tokyo and Nishininomiya in the west without the need for refueling. 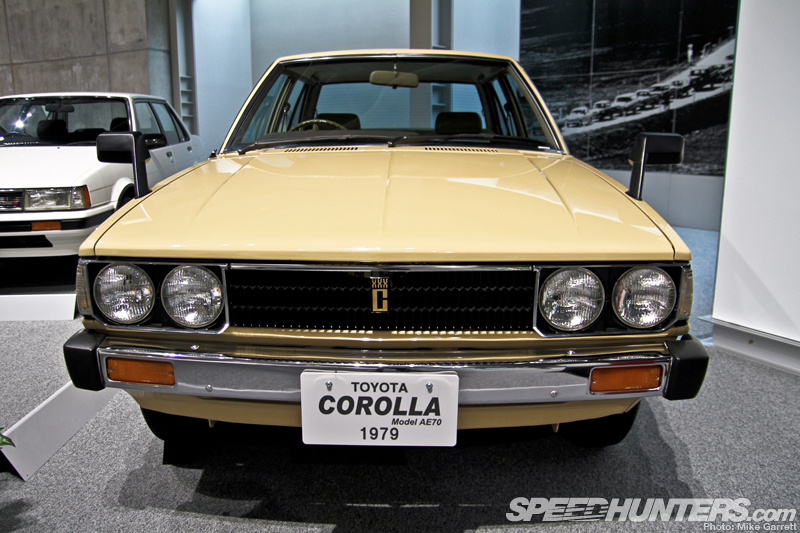 The new third generation Corolla debuted right in the midst of the fuel crisis in 1974, and before the end of its lifespan the 30-chassis Corolla would meet the strict emissions regulations being set around the world. 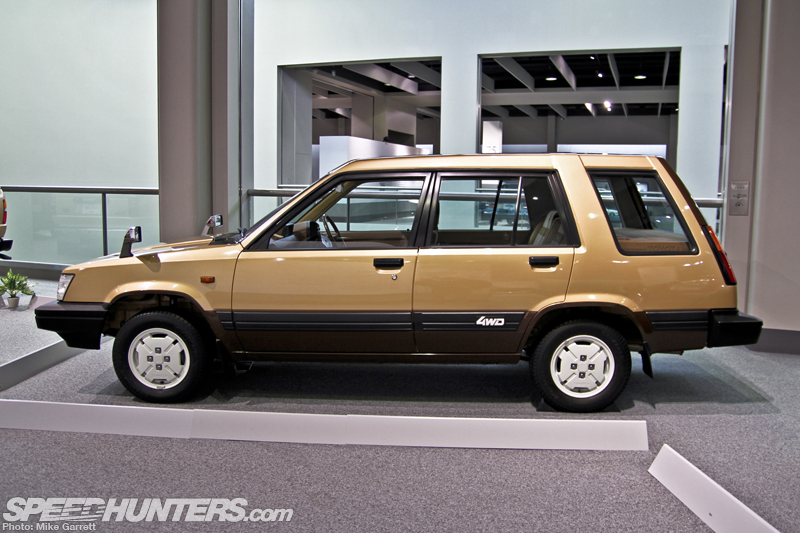 It was also massively important to the growth of the Corolla brand across the planet. 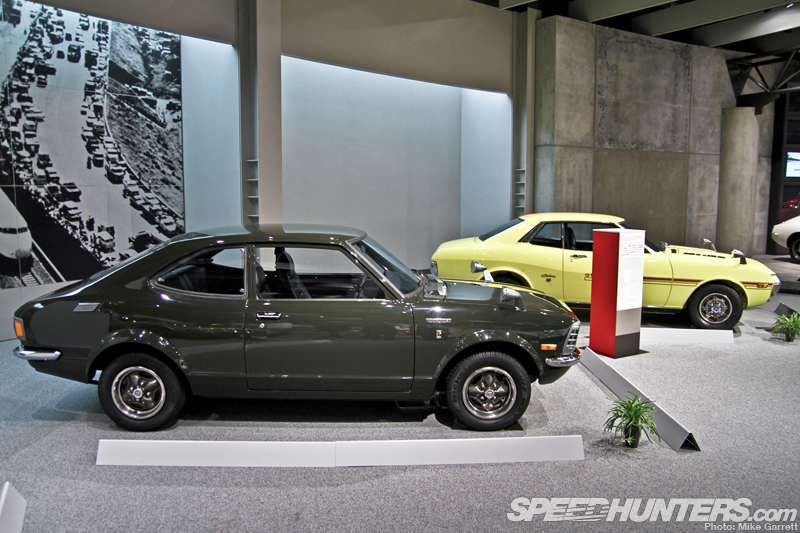 Next came the fourth generation 70-chassis Corolla in 1979 – the last model to feature rear-wheel-drive across the line. The new car also left behind the leaf spring rear suspension of the previous cars in favor of a 4-link suspension with coil springs and a lateral rod. By March of 1983, total production of the Corolla had reached 10 million units. The introduction of the fifth generation car in 1983 saw the biggest change in the model’s history. 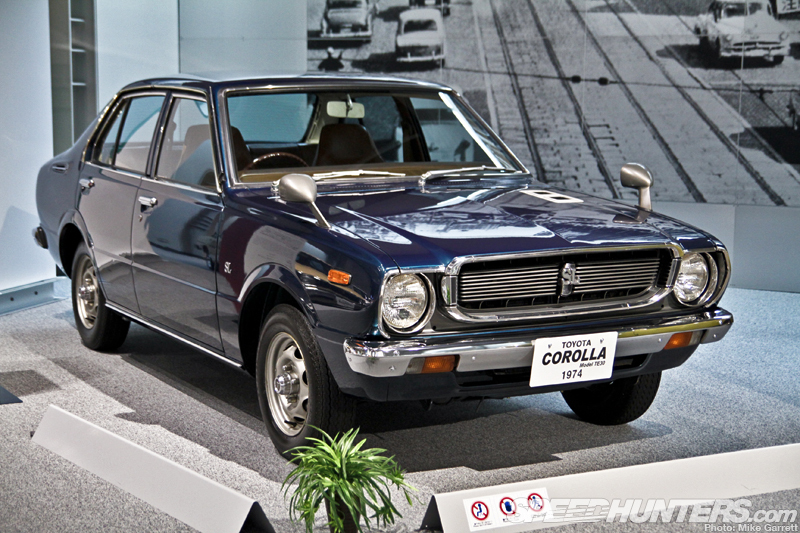 As was becoming the trend across the world, the Corolla switched to a front-wheel-drive platform with four-wheel independent suspension and the first application of an electronically controlled four-speed automatic transmission in its class. 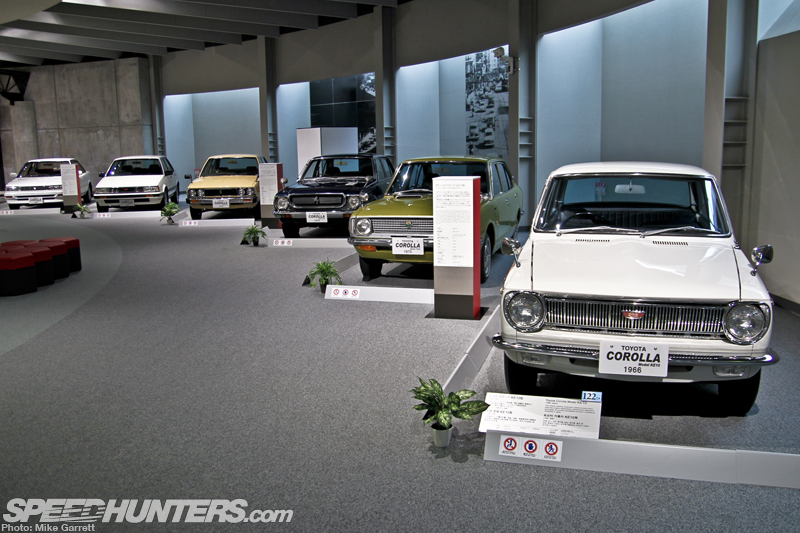 The exhibit also gives plenty of attention to the more sporting examples of the Corolla released over the course of the model’s history. 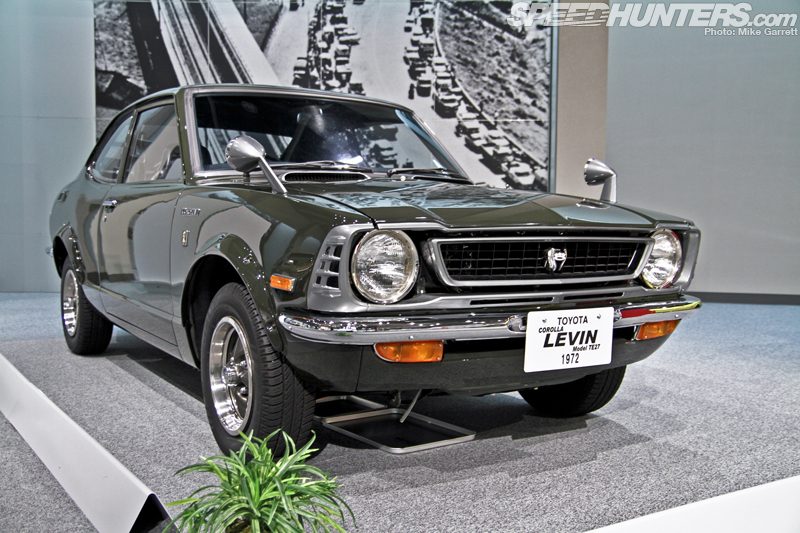 An absolutely pristine 1972 TE27 Levin is present for example. While we’ve all pretty well accepted the TE27 as bonafide classic, it’s historical importance cannot be underestimated. 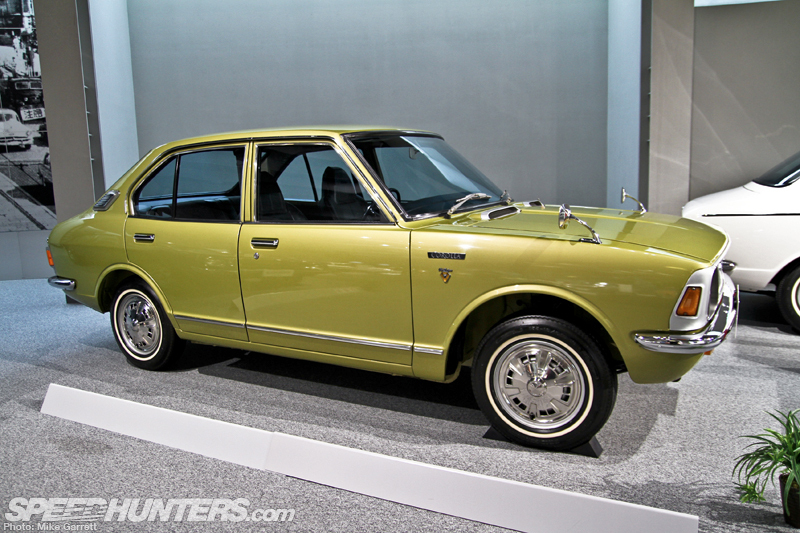 We are talking about a double overhead cam-powered Corolla in the early 1970s after all. 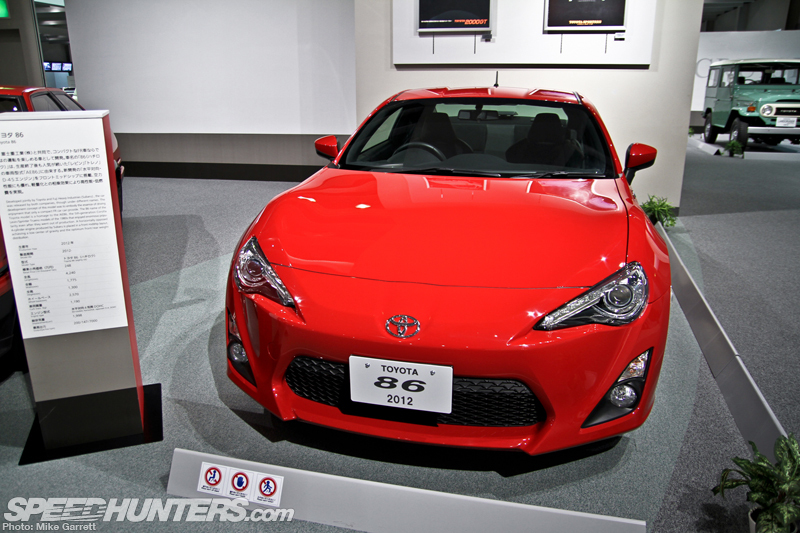 … which fittingly was parked right beside a 2012 Toyota 86. It’s really only natural that the Toyota 75 display would include the car that is engrained with the DNA of so many Toyota sports cars that came before it. 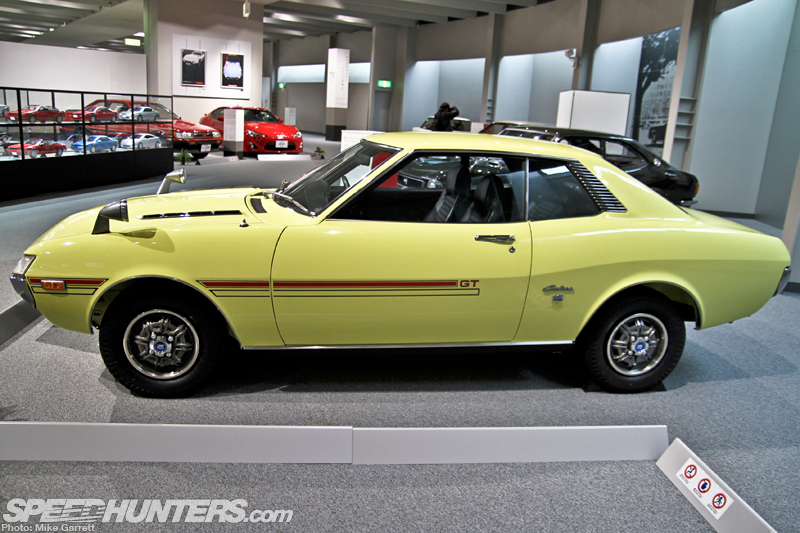 Another car that is no doubt part of new 86’s spirit is the first generation Celica – represented here by a TA22 model from 1970. 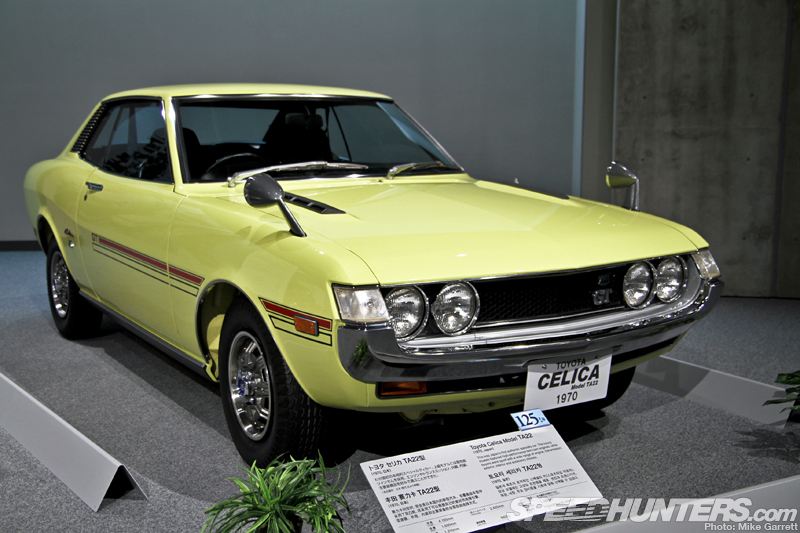 Known as one of Japan’s first ‘specialty cars’, the Celica impressed buyers with a massive list of options for owner personalization. 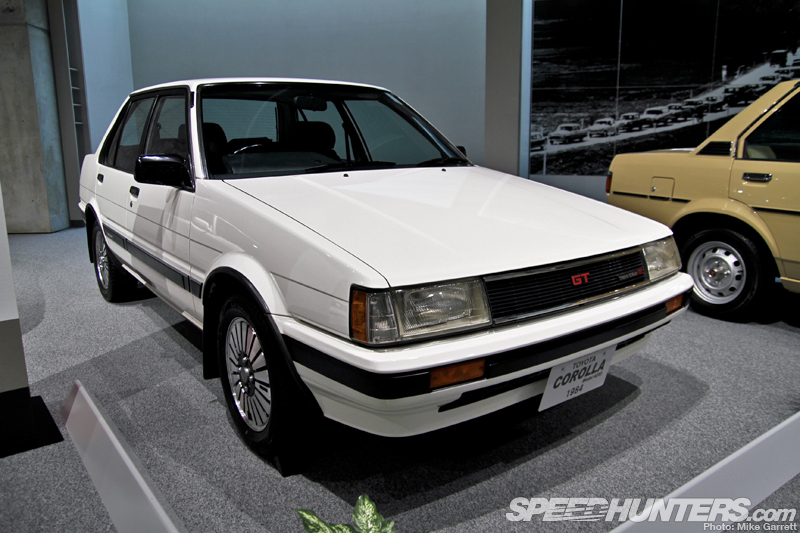 Under the hood, the twin cam, eight-valve engine available in the GT model was well ahead of its time, and yet another sign of a rapidly advancing Japanese auto industry. 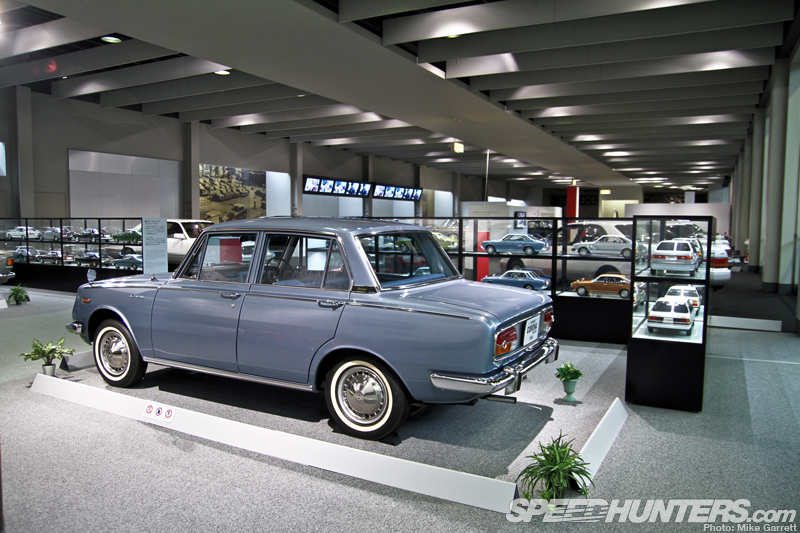 Another important Toyota that’s not to be overlooked is the Corona, which was represented with a few different examples in the exhibit – including this third generation car from 1964. 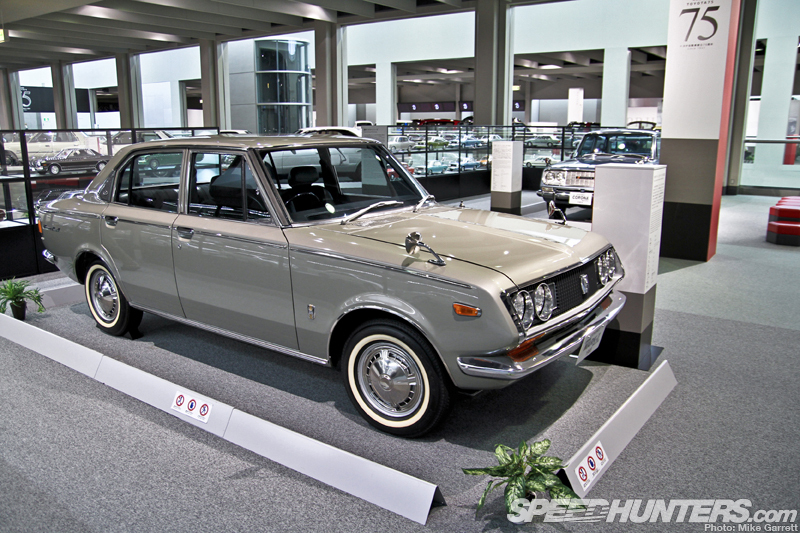 Within just four months of going on sale in ’64, the Corona became Japan’s best selling car and it would also become the first model to sell one million units in Japan, in addition to much success in overseas markets. In 1968 Toyota debuted a new model that would be positioned in between the Corona and the Crown. The car was known as the Corona Mark II, with the name reinforcing the idea of ‘upgrading’ from the normal Corona. 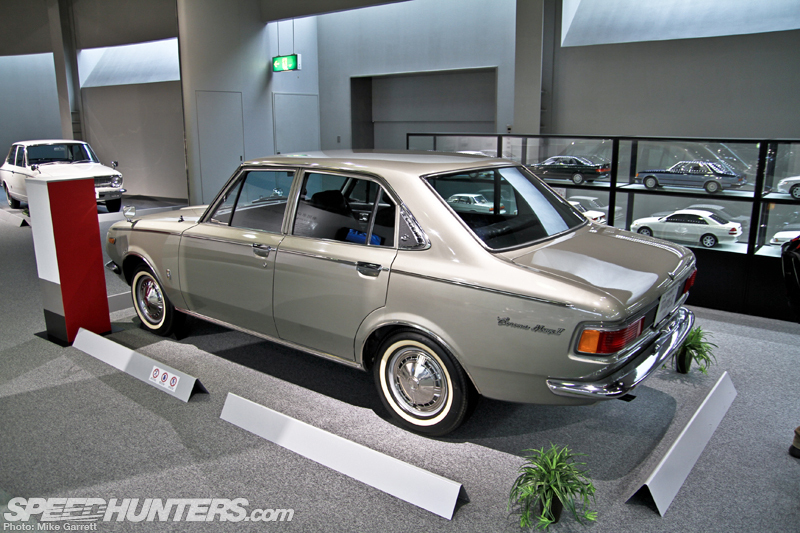 Later on, the Mark II went on to become one of Japan’s most popular sedans, all the way up to the point where it was replaced by the Mark X in 2004. 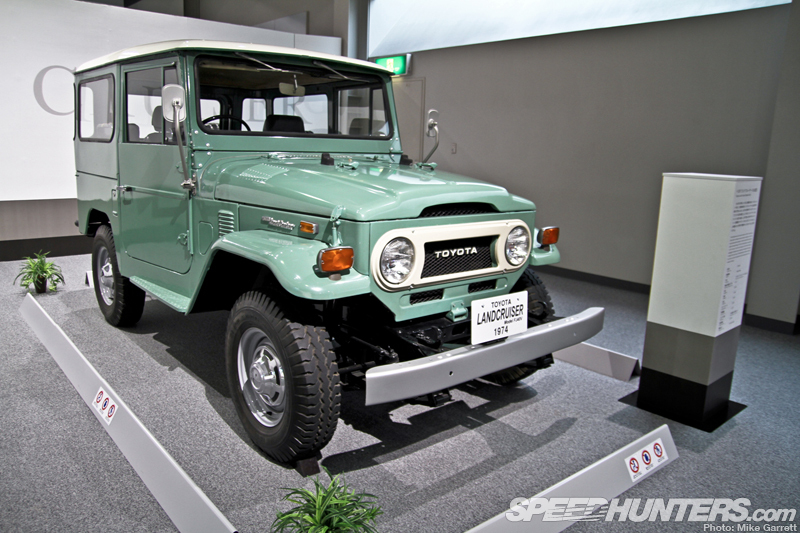 In terms of Toyota’s international success, few models were more important than the rugged Land Cruiser – represented here by the legendary FJ40. 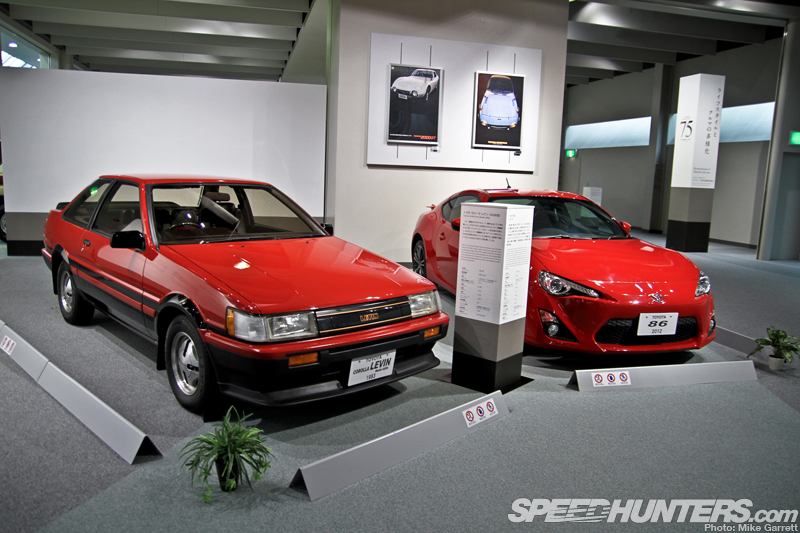 There’s no way an exhibit about Toyota’s history could be complete without one of these. Equally important are the Toyota Hilux pickup and Hilux Surf SUV (better known in the US as the 4Runner). With a bulletproof, offroad capable chassis and a wagon-like body the Hilux Surf and 4Runner deserve a rightful spot in SUV history. 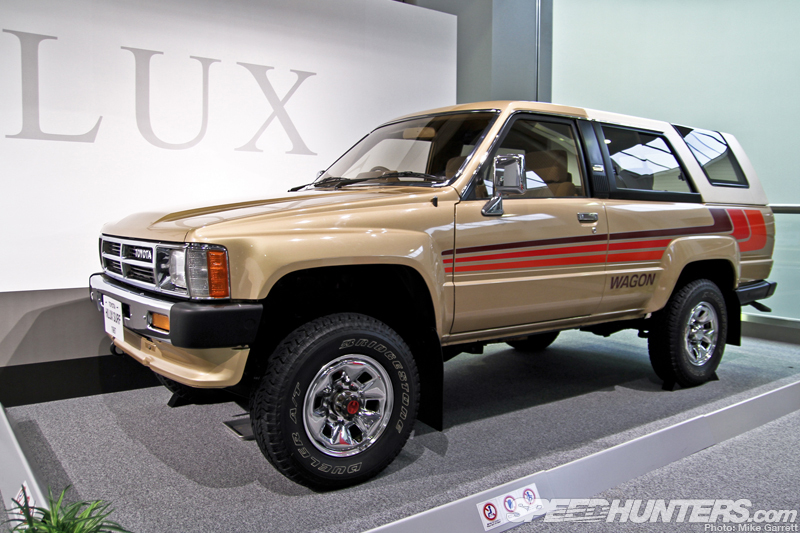 As with all the other vehicles Toyota brought out for the exhibit, this 1984 model was in showroom condition. I wonder it’d be worth on the private market? Let’s not forget about vans either. 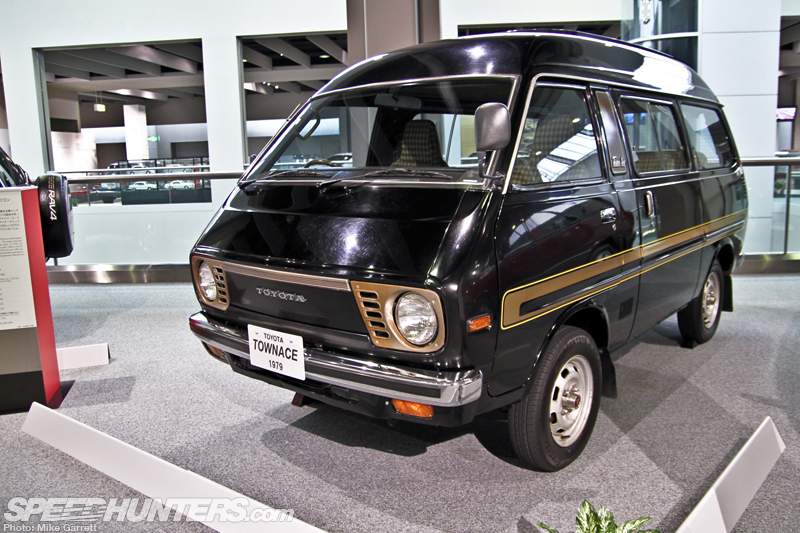 Today the commercial and family vehicle market in Japan is dominated by vans and minivans, but it wasn’t always like that. 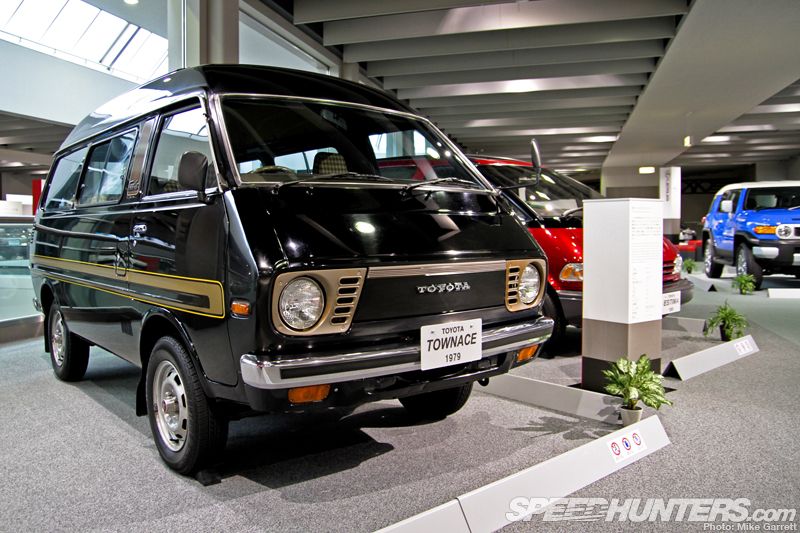 Vehicles like this Toyota Town Ace from 1979 were built to respond to the rapidly growing demand for vans in the Japanese market during the later part of the ’70s. 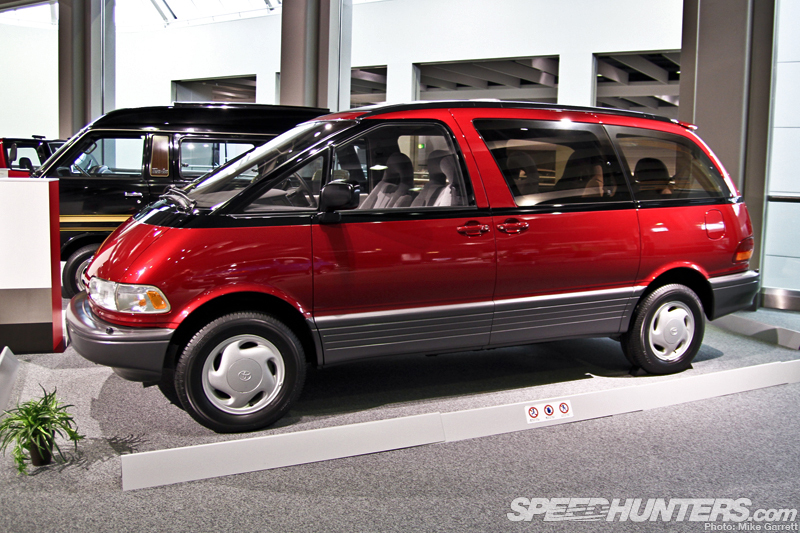 By the beginning of the ’90s the minivan was experiencing a boom in North America and Toyota launched the futuristic first generation Estima/Previa to capture some of the market. 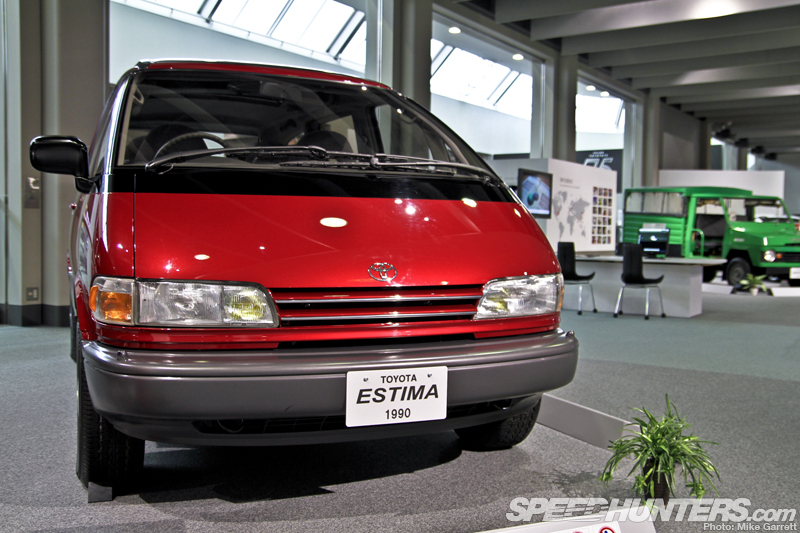 Thanks to a center-mounted engine with a 75-degree tilt, the Estima was able to provide room for seven passengers along with superior stability on the road. The van would also see big success in the home market as well. Also part of the display is a Toyota Tercel from 1978. 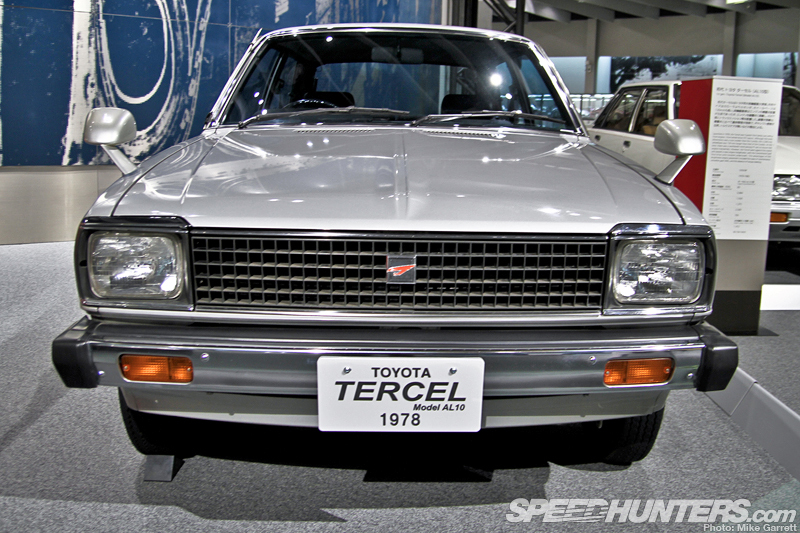 Although it featured a longitudinal engine placement similar to the Corolla, the Tercel is notable as being Toyota’s first front-wheel-drive passenger car. But because of the engine layout and large bonnet, it wasn’t a big seller in Japan. 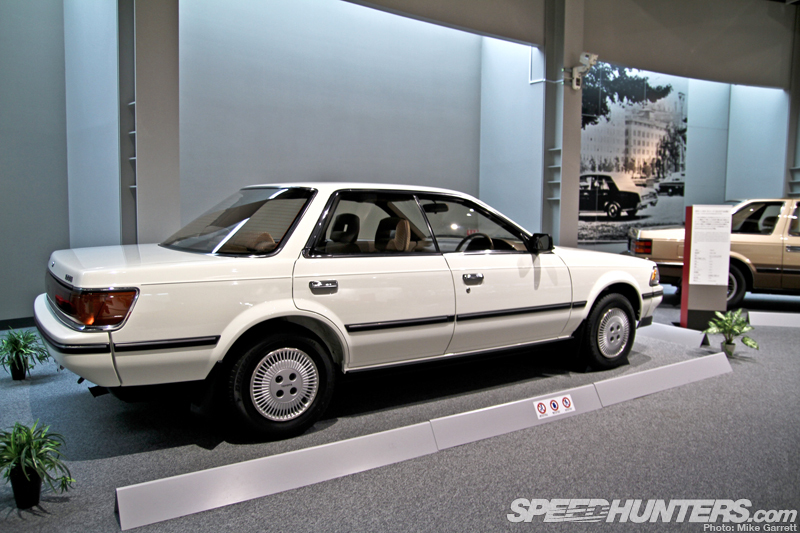 It wasn’t until the introduction of the new Camry in 1983 that the more common transverse engine configuration appeared for Toyota’s FWD cars. One of the more unusual cars in the exhibit is this Sprinter Carib (Known as the Tercel Wagon in the US). With a part-time 4WD system, it was built for those that wanted the capability of 4WD with the size and dynamics of a normal passenger car. 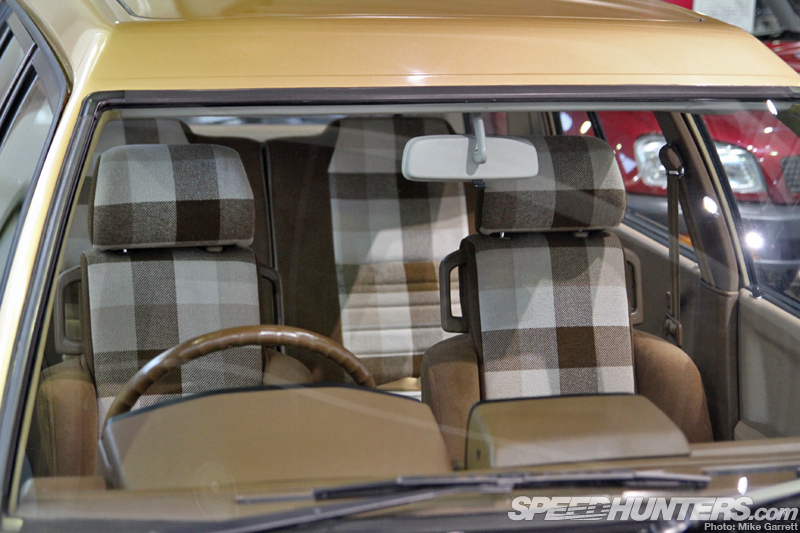 And how about that awesome brown checkered interior? So good. 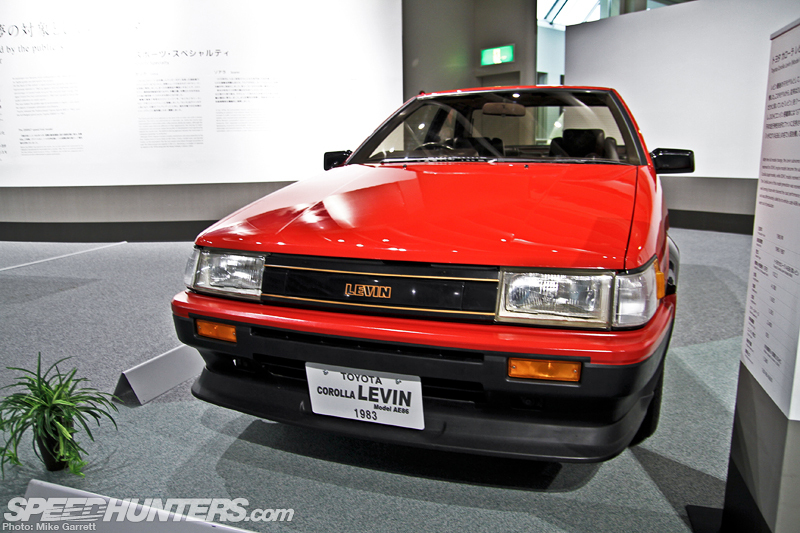 Another one of the cool ’80s machines that’s part of the group is this 1985 Toyota Carina ED, in which the ED stands for ‘exciting and dressy’. With it’s unique four-door hardtop roofline, the Carina ED had one of the world’s lowest body heights for a four-door passenger car at the time. 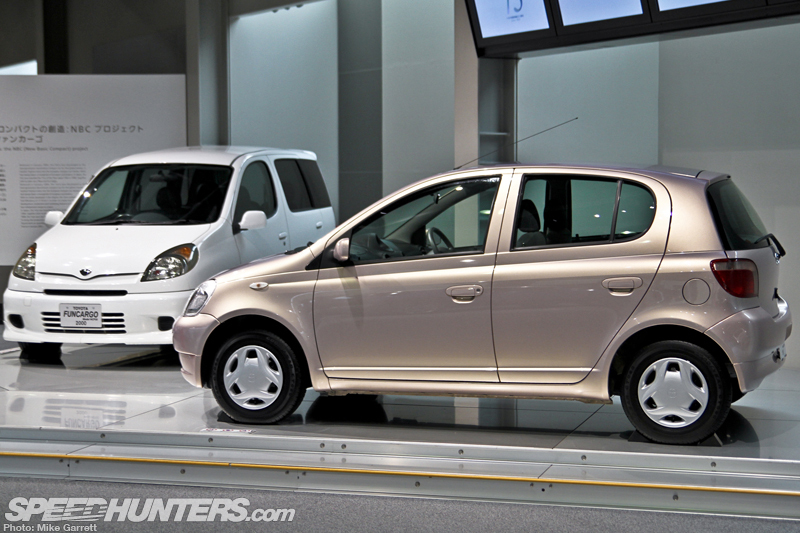 Representing the more contemporary side of Toyota’s three quarters of century are cars like the first generation Vitz, which was released in 1999 and quickly became a huge seller in Japan, along with Europe and other parts of the world where it’s more commonly known as the Yaris. 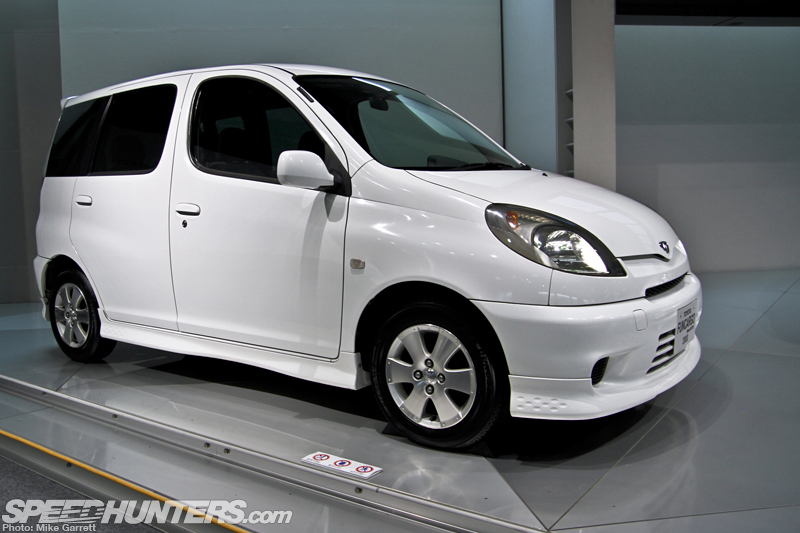 Along with the normal Vitz, there’s also a 2000 Toyota Fun Cargo – because cargo should be fun. As one of Toyota’s most important vehicles of the last couple decades the first generation Prius is represented as well. 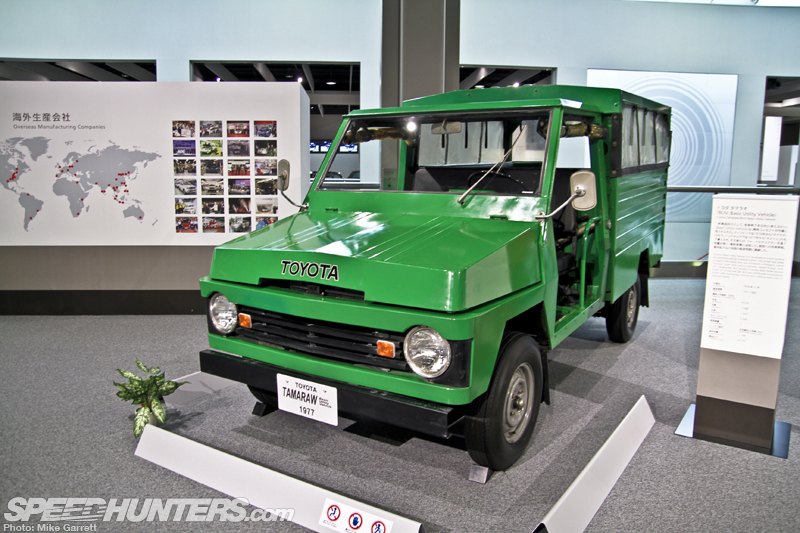 In addition to Japanese market vehicles, the exhibit also includes some examples of Toyota’s global reach – including this 1977 Tamaraw BUV which was built for Asian markets like the Philippines and Indonesia. 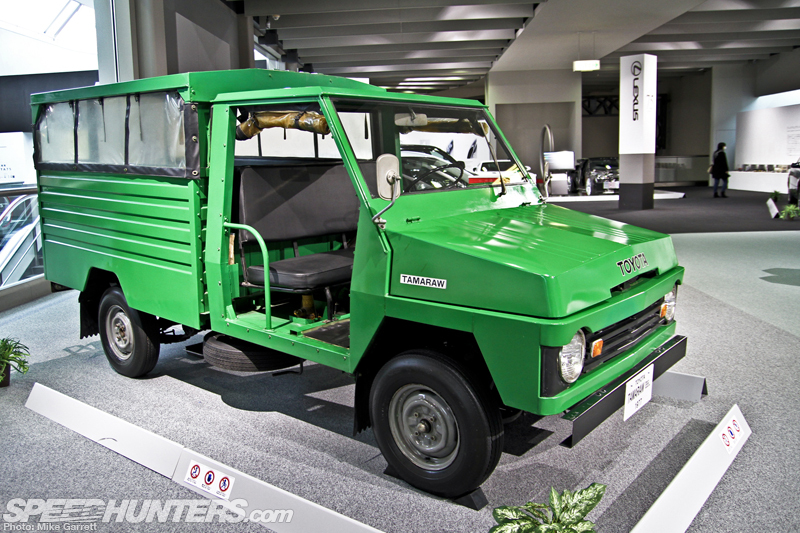 As its utilitarian profile suggests, the BUV stands for ‘basic utility vehicle’. The BUV became a huge seller and allowed for much economic growth in its local markets. Just one tiny example of Toyota’s massive international presence, with vehicles being engineered for specific countries and markets. 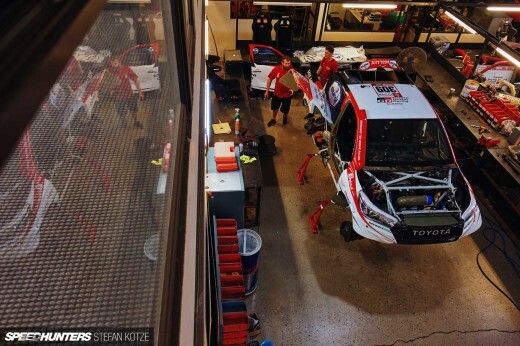 Even with all that, I’m still not quite done with my run down of the Toyota 75 special exhibit. Next time I shall return with some more on those strange miniature cars you may have spotted in the background of these photos. I don’t think you’ll want to miss it, as it was my personal highlight of the entire exhibit. More soon. 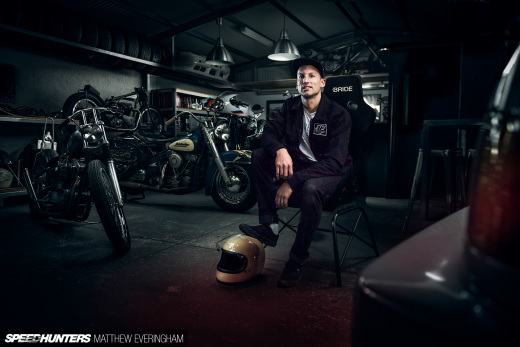 Fine example of the history of one of the worlds most successful motor companies. Every car looks as though they have never seen an open road. Bahaha! I had that exact Tercel Wagon!!! In Metallic Orange with brown plaid interior. It even had a clinometer to let you know if you were exceeding safe incline or turning angles. How funny. I work for a large dealer group now out of a Toyota delaership and am back in the Toyota family of ownership. That Tercel got me through a huge snow blizzard when nobody else could get anywhere! 333,000 miles when I laid it to rest.